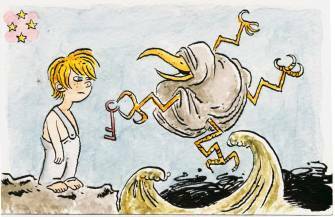 T. Alixopulos has long been on the radar of small-press comics fans but his more recent books have placed him in that more general category of cartoonists to watch. 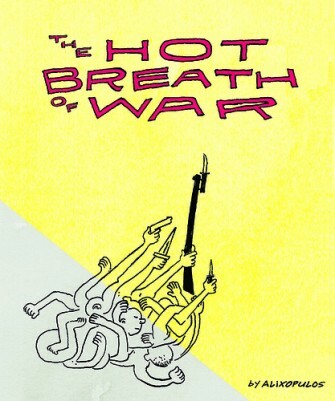 After completing two lengthy, ambitious comics in Dread and Mine Tonight, earlier this year Alixopulos released Hot Breath of War into the market through Sparkplug. 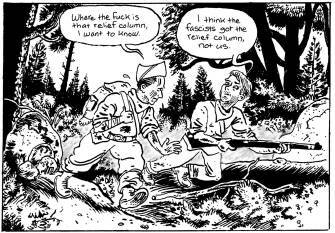 Hot Breath of War filtered the cartoonist's romantic, restless nature and growing political consciousness through a style reminiscent of the magazine cartoon essay of decades past. The work admirably eschews direct confrontation and sweeping generalization for a cascade of narratives that at times are more obtuse than they are strident. Together, they paint as effective a portrait of the nation's mind-set, at least from one artist's view, as any comic currently out there. I owe the cartoonist a personal thank you for how quickly this interview came together, and I urge you to check out some of his work either on-line or the next time you find yourself at a major alt/indy show. TOM SPURGEON: I know almost nothing about your background. The name is memorable enough I'm thinking that I remember it on-line and then started seeing you at shows like San Diego and maybe SPX. How did you start doing mini-comics? 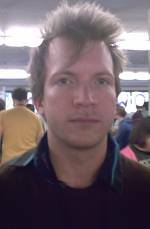 TREVOR ALIXOPULOS: I was born in Hawai'i and grew up in California, in the outer rural fringes of the Bay Area. I'd always read comics, superhero comics, RAW, Tintin comics, whatever, growing up, and had ideas of being a cartoonist. But back in the early-90s superhero comics reached such an absolute nadir of quality that they bludgeoned away all my remaining adolescent interest in being a penciller. 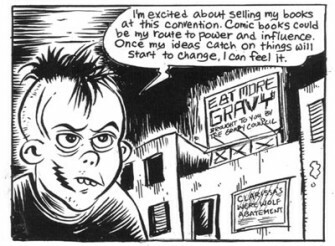 I could relate more to comics like Love & Rockets, and 'zines were still kind of on the upswing, it seemed like you could make minis and people somewhere out there would read them. I went to San Francisco's Alternative Press Expo for the first time in 1994, but really began doing comics in earnest around 2000. SPURGEON: What do you think kept you at it when a number of your peers stopped? ALIXOPULOS: I came to mini-comics toward the end of the '90s zine-explosion, just as the internet was sort of subsuming and supplanting it. But paradoxically, the new ease of communication and networking gave small-pressers a new lease on life. I might have quit anyways if I had been more isolated, but I was fairly close to a comics hotbed. Around 2001 I started coming into San Francisco regularly and meeting people like Dan Zettwoch, who was my own age and doing mini-comics too, or Jesse Reklaw and Andrice Arp, who were a bit older and seemed more established, and that gave me a lot of encouragement. More to the point, though I'm self-effacing I have a lot of pride and quitting comics was never really an option because it would have felt like a personal failure on my part. SPURGEON: I remember liking your appearance in the Chris Brandt film Independents. Where was your segment filmed? It looked like you were on a loading dock somewhere. That film was about the creative impulse; is that something you've ever thought about, why you do this? ALIXOPULOS: That sequence was actually filmed in the loading docks in the back of the APE convention hall, in San Francisco. I was trepidatious about the project originally, but was really pleasantly surprised at how that interview turned out, given that Chris threw it at me in the closing minutes of the convention and I may or may not have had something to drink just prior. It was perhaps appropriate that Chris interviewed me at a Con, because that's usually when I wonder "Why am I doing this?" When I'm alone with pen and ink it rarely occurs to me because it's so enjoyable. SPURGEON: How do you look back on your early mini-comics at this point? They seem very different than your last two or three books. They also seemed about ten years out of their time, more like bursts of energy than something was formally ambitious or controlled and literary-minded. What do you like about that work and is there anything about that work to which you feel little or no connection now? 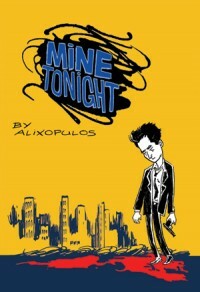 ALIXOPULOS: What I like about my older mini-comics are some of the things that I feel a bit disconnected from today, and that is their spontaniety. They have mysterious completeness that comes from doing them only when I felt inspired, they emerged from the wealth of time at a twenty year old's disposal. It's like they arrive fully-formed. The graphic novels feel more messy and sprawling than my mini-comics, but at the same time weightier, more exploratory. My old minis were in this smart-assed underground comix mode. Some of that was my age and some of that was the times, the sort of sheltered sarcastic doldrums at the turn of the century. As much as they might seem out of time then, they're doubly so now. I feel like the world around me changed to such a degree that my brand of satire was inappropriate and reductive. The times had become more charged and cinematic and they didn't seem to fit into gag strips anymore. SPURGEON: Do you agree that Dread was an important book for you in terms of your development? It seemed more ambitious than some of the earlier work, more of a type in some ways visually with what you're doing now. What do you remember about doing that book? 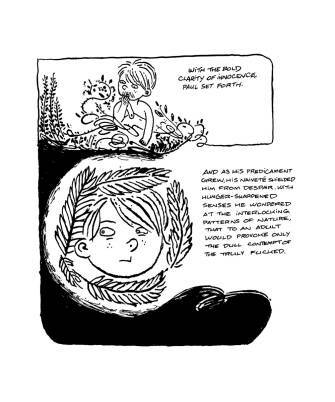 ALIXOPULOS: Dread was the first comic I did that I felt didn't fit easily into a mini-comic format, it's longer and weirdly paced, and was dismayingly difficult to physically assemble. 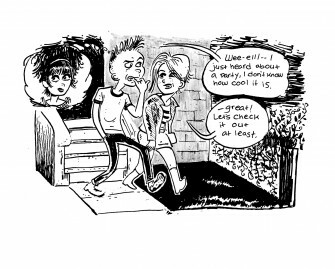 I remember Dread coinciding with a weekly comics workshop/critique night that some of the Bay Area cartoonists (Lark Pien, Andrice Arp, Jesse Reklaw) were organizing. We'd meet in an apartment or a warehouse space and sort of methodically go over what we were working on. I'd never really planned a book out like that before and I'd certainly never been forced to lay out all the pages on the floor in front of my peers and read it aloud. It was a good experience, it probably made something that easily could have been far more shrill somewhat more palatable. The book grew out of a scared, hopeless feeling about the way the world seemed to be going, but it ended up being far more formal and cool in tone than I expected. SPURGEON: I went searching for Dread on the Internet and one page on which it's mentioned says that it's debuting at SPX. Can you talk a little bit about having those kind of comics shows available to you as a cartoonist? Is it important to have something like that to focus your publishing plans or are they incidental to what you'd be doing? ALIXOPULOS: The shows did provide a rational structure to an endeavor that in my darker moments could seem like some dadaist thought experiment. I remember Vanessa Davis told me something that Tom Hart told her, "Don't get flustered about doing your comics, nobody's watching and nobody cares." My problem was I was certain that that was actually the case. By going to shows I could make-believe that people out there care that I "debut" something even if I knew rationally that they probably didn't. There are endless possibilities for procrastination with minis, so it helps to work toward a real event. SPURGEON: For that matter, I think of you as part of a larger group of cartoonists, mostly on the West Coast. Do you feel like you're part of a community in that sense? Has it been important to you to have friend in the cartooning field in terms of feedback or your overall development? ALIXOPULOS: Santa Rosa's a smallish city, so it was just a welcome experience to be able to drive an hour to the Bay and be able to meet up with three, six, eight cartoonists at a time. 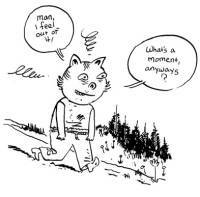 There was a certain esprit d'corps initially where I was just happy to meet any cartoonist, but over time things settled out into community that I felt a kinship with creatively and personally, which I think is still there but a bit scattered geographically now. Dan moved back to the Midwest, Jesse and Andrice moved to Portland, as did about a million other cartoonists. I think the artists on the Global Hobo site were kind of a pure representation of that particular community. SPURGEON: Mine Tonight is an extremely ambitious work. It switches storytelling styles mid-stream, thwarts a lot of easy narrative expectations, and even has you in it as a character. How was that book written? What kind of process led your from concept to getting it on the page? ALIXOPULOS: I'm glad you think it was ambitious! I guess it's probably not even as complicated as some superhero story arcs but it felt overwhelmingly complex at the time. Sparkplug approached me about doing a 70-100 page graphic novel, and I had no novel. I had just a few fragments of ideas; a secret agent during the 2004 elections, a hillbilly frog, a trip to the island of Nauru. I filled a notebook with diagrams and thumbnails, basically jamming all the ideas together and then boiling off the excess. Eventually a very personal story of redemption seemed to emerge from it. Once I had a general idea of it, I would thumbnail out a chapter at a time in the notebook, and then switch to my sketchbook and draw the final product. Working on a long, dense book had its challenges, I'd feel like I was making progress and then realize "Oh wait these two characters have to meet at some point but I forgot to figure out how." SPURGEON: I don't know if you'd want to talk about which parts of Mine Tonight were based on your experiences, but I was wondering if you could talk in general about doing a book that seems a snapshot, or maybe better an exploration of a state of mind at a certain time in one's life. Was it difficult to work with material that seems while reading it to be very close to you, or did that book make it to the page easily? ALIXOPULOS: Both Mine Tonight and THBOW are definitely definitely explorations of a certain time one's life, so I guess it's an open question at this point if I can work any other way. I needed to invest a lot of myself in Lukas, the main character, so I could see him through to the end. I guess what worries me about pulling so much from my life would be to somehow cheapen my memories, that someone from my past might read it, recognize a few things and then assume that the whole book was a stripmine job. But it's much more about who I was while I was writing it, and because it was in the end a hopeful book, I felt good while I was writing it and it felt good to write. I appear as a character in the Mine Tonight, but "my" role in it is almost as a feint, to de-emphasize in the reader's mind any distracting autobio suspicions they might harbor toward Lukas. I did get involved in activism in the late '90s, and mined some specific instances for the book. But beyond those specifically I wanted to apply my experiences in a more universal way to Lukas, about how you find that real life doesn't neatly fit into ideological and moral constructs, but that doesn't exempt you from trying to do the right thing. SPURGEON: How did you start work with Dylan [Williams, Sparkplug's publisher]? I don't know that I've talked to too many people that have worked with Sparkplug, can you talk a bit about the process of doing a book with them? Do you get any feedback editorially or design wise? How closely does Sparkplug adhere to your wishes on the books you do through them. I'd be interested in hearing about your overall experience, or if there's anything that really sticks out about it. ALIXOPULOS: I was aware of Dylan from some years back, he'd been in the Bay Area before moving to Portland. He came along offering to print a graphic novel at a time when I was felt creatively hemmed in by the restrictions of minis and financially busted from jet-setting small presserdom. I'd run up my credit card on mini-comics and comics shows, and the returns are so slow and small for even a wildly successful mini that it's like you never get them, they get reverse-amortized or something. So I was just grateful. Sparkplug starts from the premise that the artist calls the shots creatively, because their vision is Sparkplug's whole reason for publishing the book. SPURGEON: Was I onto something when I suggested that the visual style of Hot Breath of War was drawing on the visual essay style from cartoonists and almost-cartoonists of the 1950s and 1960s? Do you consciously develop style? 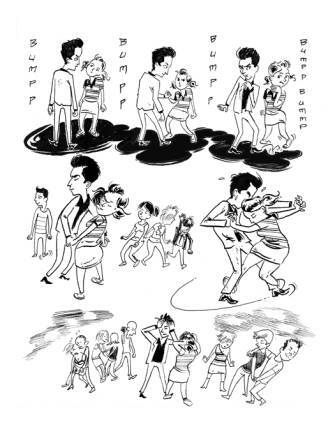 ALIXOPULOS: I can't pin down one specific iconic work but I do really enjoy that essay style that Jules Feiffer and those old New Yorker cartoonists pioneered, I like the measured pace of it, how it feels both gestural and considered. And even today it feels modern, engaged, which was an effect I wanted for THBOW. Another thing about that style that I like is how it has no firm distinction made between words and pictures. 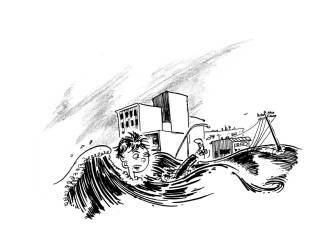 That's real cartooning to me, when the art is direct, like handwriting. Within the bounds of my own overall style I think I'm a bit of a chameleon, I try to tailor-fit each strip to the subject. This gets me into trouble though, because there are a couple of characters in THBOW who are in more than one story, but I think the variation in style obscures that fact. SPURGEON: I don't remember where the title "Hot Breath of War" comes from, although the phrase isn't totally unfamiliar. Is that a specific quote? ALIXOPULOS: Not really, it was just one of those stock phrases, i.e. "Like a velvet glove cast in iron" that seem to float around. I heard it somewhere and liked the sound of it and filed it away. Then one night while tending bar at this local pub/bookstore a country song came on that had a lyric about "the hot breath of this monkey on my back," which reminded me of it. The themes that all that suggested, war as an addiction or obsession, with these sexual overtones, seemed rich to me. I started thinking about what kind of book would have that title and those themes and went on from there. SPURGEON: Speaking of which, if I remember correctly, you open the book with a vicious quote from Thomas Paine that indicts war as a business of nations. Is Paine part of your reading? Are you well read historically, politically? What kind of reading informs your work, do you think? ALIXOPULOS: I'm fairly well-read historically, but I'm strictly under-grad literarily, because I'm a lazy fiction-reader. I've only read bits of Thomas Paine, but his biography has always seemed fascinating to me. I'm almost more interested in learning how people lived their lives than what they have to say about them. 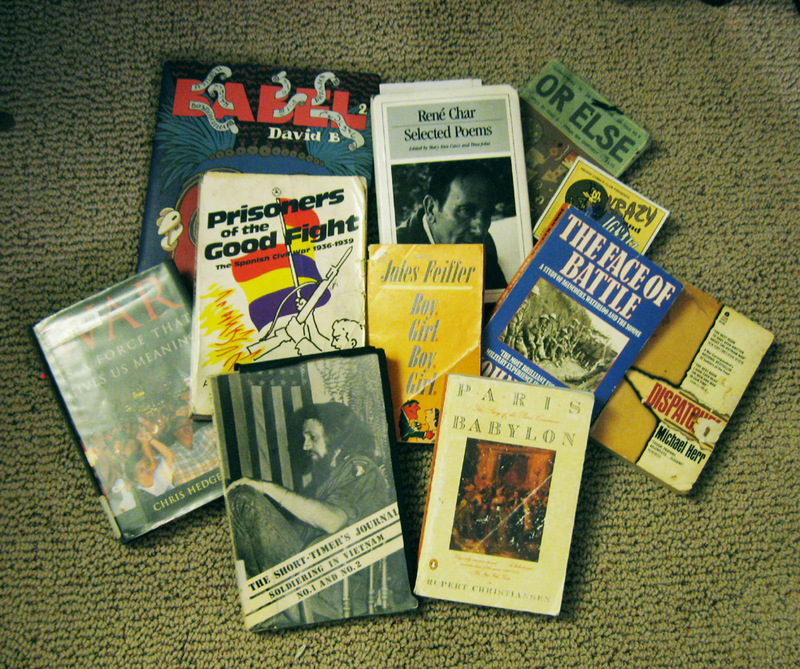 My dad is a history professor and I read a lot of nonfiction and academic stuff. I suppose I'm more likely to pick up a book of letters average people wrote to FDR than John Steinbeck, say. I draw some from history, philosophy, mythology, the Bible, essayists like George Saunders, Mark Twain, George Orwell, Edward Abbey, Alain de Botton, and a tiny bit of poetry. SPURGEON: There's a great deal of sprawl to Hot Breath of War, both in terms of it being a number of short stories and those stories varying greatly in terms of subject matter and tone. Did the book come together in one sustained burst, or is it constructed from a number of independent, component works? How did you feel about putting together such different stories under one cover, how those shifts in mood and story type might be interpreted by the reader? ALIXOPULOS: The other day I came across some early thumbnails for it and surprised myself by how planned out it was. I knew which stories would make up the book well before I wrote any of them, it was like I drew up a Cliff's Notes version of the book before I began. In some strips I had the whole narrative pretty much in mind at the start and in others just an image, "Little boy, lost in the woods," say. After drawing them it was a matter of arranging the stories in a way that read best, which ended up being close to how I'd originally sketched it out. By grouping such different stories together, without comment or explicit explanation, it was my hope that the connections the reader would draw would feel more charged and vital than if I had spelled them out for them. I wanted to do a comic that had jarring transitions, but ones that took place within a realm that the reader would want to revisit. SPURGEON: Hot Breath of War seems to grapple with the mood of the entire nation, the way that war and certain politics have changed our way of thinking, altered reality as it were. How careful are you when dealing with these big issues in terms of presenting your narratives when it comes to becoming overly didactic or shifting from parable to polemic? Or is that even a concern? ALIXOPULOS: It was definitely a concern with both books. It would have been more of a concern if I had been pushing for some specific solution, but I don't think THBOW does that. The book struggles with its observations and tries to give them the weight they merit, but much of those observations are made in the telling, in the way the stories unfold. As an example, the opening story of THBOW is this sort of broad slapstick cartoon battle, but the story's punchline is not the point, it's in the way the characters talk past one another and speak without communicating that works to the books themes. One thing I've noticed with political art is that it's very easy for the artist to lose their unique voice, and in so doing lose control of the work. It seems like when we speak about our private lives we use our own language, but when we talk politics we tend to use the same old cliches. I tried to instead use my own symbols, as well as taking classic but disused cartoony themes, from things like Popeye or Betty Boop, and applying them to modern concerns. SPURGEON: You mentioned in an e-mail to me that you were at the point in the book's cycle where you were able to think about it differently, maybe even talk about it in a way you weren't prepared to when it came out. Can you talk about that a bit? How has your ability to talk about the book changed? How might you think about the differently now? ALIXOPULOS: It is much different now, a completed book is a whole different animal. I think that the creative process is like many endeavors in life, from business to romance, where you must steadily work towards a goal without looking too directly at it, and without appearing to pursue it overly much. Gilbert Hernandez said something about how when Tonantzin died it surprised him, even though he knew it, on some level, and I kind of get that. You hide the things you do when you're doing them but then that's a problem when you're done and you're expected to explain it! So going back to my original explicit plans for the book has actually helped me talk about it, as did reading reviews of it. When I'm working I have to think in comics, but translating it into words can be awkward. Like, in my mind at the time, the narrative leaps the book makes related conceptually to the logical leaps people make when we go to war, but when I say that out loud it sounds kind of funny. SPURGEON: Was there anything you felt people simply didn't get out of that work that you knew was there? ALIXOPULOS: There aren't that many outlets for in-depth criticism in comics, so I've been generally satisfied with attention it has received. Sometimes people get distracted by the structure of the book without particularly paying much attention to the formal nature of it. I felt like the book's arrangement is necessary; it deals with such big themes that I had to address them with a light touch, in an impressionist manner. I'm a young guy, and there's only so far beyond my field of experience that I can speak authoritatively about. But at the same time, I do want to speak to these themes, so I leave the reader a lot of discretion and I hope that we can meet in the middle. SPURGEON: I've really liked the little bit of sketchbook work of yours I've seen over the years. Are you still devoted to working in a sketchbook? How important has that been to your growth as a cartoonist? ALIXOPULOS: Keeping a sketchbook began as a grudging concession to artistic practice and became an integral part of my creative process. I was frustrated because my comics seemed stiff and graceless compared to my sketchbook drawings. My work-around for this performance anxiety was to dump my Bristol board and do everything in my sketchbook. Ever since Mine Tonight, all my comics have been ripped out of the sketchbook. I probably couldn't have gotten away with this pre-photoshop, but now your originals can be as ragged and messy as you like. SPURGEON: How have people reacted to your last two books, given this year's long domestic political process? Is there anything about the way this year's presidential election has gone so far, or anything about the last days of the present administration, that interests you as an author having just completed two long works about politics and culture? ALIXOPULOS: I was wrapping up THBOW as the election was just ramping up, and some of my early reactions made it into the book. One of those was the use of language and how it has evolved in politics, from its former purpose as an Orwellian gloss to just plain white noise. It's become common to see talking heads on cable news create a sort of surreal situation where no one can understand what they are saying, but that being OK because it drowns out their opposition as well. Sort of a murder-suicide of rhetoric. I have a few ideas bouncing around, but I think that, for myself, and probably many other people as well, at this point I'm just sort of holding my breath until we find out what kind of country we'll all be living in. SPURGEON: You turn 30 this year -- or turned 30. Has hitting that milestone had any effect at all on your orientation towards your comics, your art? Have you given any thought where you'd like to be when you're 40? ALIXOPULOS: I think turning 30 actually looms over much of The Hot Breath of War, despite the sort of worldly and historical elements to it. The two longer stories in the book are rooted in a mid-'20s lifestyle that I was looking back on, of going out at night and trying to make some desperate connection against a backdrop of what to me seemed like desperate times. There is something simultaneously nihilistic and hopeful about those stories that I felt would relate to the broader world that we live in. Back when I was 20 there was no way I would have predicted that I would have done a book like this, it was the furthest thing from my interest at the time. So I guess I hope that when I'm 40 I'll create something that's equally unexpected.